Fly to Ho Chi Minh City, formerly known as Saigon, then transfer to your hotel. Check in for a 2-night stay and then relax or take a walk to stretch your legs and begin getting acquainted with the city. Savor a rare glimpse of rural life as it has been lived for ages. Begin your morning with a ride on a traditional rickshaw in Tân Châu. Observe the making of floor mats from sedge and slippers from uzu. Afterward, visit the floating fish farm by wooden sampan, then take a boat ride to Vinh Hoa, known as “Evergreen Island.” Here, you can take a short walk to see various methods of traditional Vietnamese farming and the crafts and other daily activities of local people firsthand. This morning’s excursion takes you through a Cambodian village. Afterward, take a short ride to Udon Monastery for a tour and to receive a blessing by the monks. Then continue to the next village, famous for its silversmiths. Rejoin your ship and have lunch as we cruise into Phnom Penh. 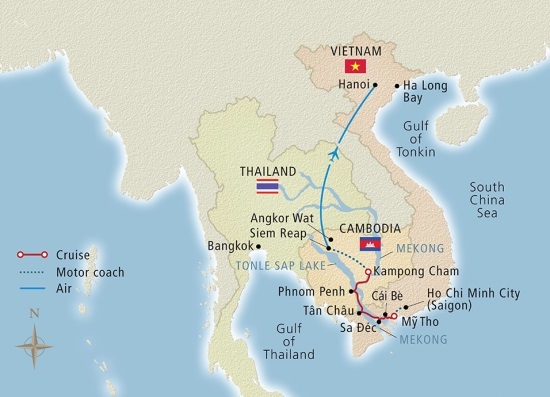 Complete your journey in Southeast Asia with a ride through the verdant farmlands of the Red River Delta from Hanoi to Ha Long Bay, then board a traditional wooden junk for an afternoon cruise and learn about the bay’s features, history and ecosystem.